Conform to Noise at Work Regulations by controlling user’s exposure to audio whilst at work to help prevent hearing damage. Conform to Noise at Work Regulations by controlling the level of the dedicated headphone output to prevent hearing damage to anyone wearing headphones on a regular basis - DJ’s, sound engineers in recording studio’s, students listening to audio via various media. Additional connectors on the rear can be used for remote data logging or to trigger external warning devices. The precise calibration and volume controlling of the SL22 allows venues, such as clubs, theatres, pubs, schools, universities etc. to conform to Local Authority Noise Regulations. The need to conform to Local Authority Regulations is absolutely imperative, none more so than in the area of noise control. Many products are on the market that claim to do the job but these often take the form of a crude switch, either turning off the power or disconnecting the speakers, both of which are very disruptive in any event. The SL22 is different, it controls the volume, but in a transparent, unobtrusive way, that you will struggle to notice. Not only is it responsive and versatile but does so in a secure manner meaning that tampering is extremely difficult. Other features include remote dimming of the volume, as well as the connection to a fire alarm system, reducing the volume automatically during a fire and allowing the alarm to be heard more clearly. Whether in a large arena with a p.a. system and multiple speakers, or a bar or theatre, there are few things more troublesome than blowing a speaker cone or amplifier electronics. The SL22 has been specifically designed to transparently catch those unwanted SPL’s and protect your gear. Not only will it save money by reducing the cost of speaker repairs, but also reduce ’call-out’ costs of sound system service/repair engineers, lower sound system ’down time’ and the consequential loss of income, as well as the reputation of the venue. Tamper-Proof bracket (available separately) to lock-in the XLRs and conform to Local Authority regulations. Reduces ’call-out’ costs of sound system service/repair engineers, sound system ’down time’ and the consequential loss of venue income, as well as the reputation of the venue. 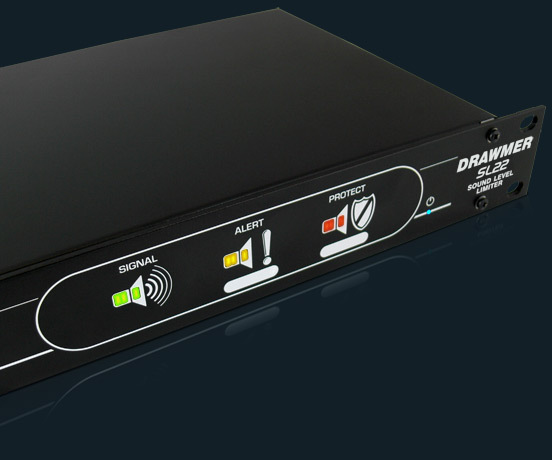 Benefiting from Drawmer’s 30 years involvement in designing industry standard dynamic processing devices, and especially the experience gained from its sister product, the popular SP2120 Speaker Protector, the SL22 has been designed to be more versatile and feature rich but at the same time just as easy to set up. The SL22 front panel features an integral security plate to ensure that adjustments to maximum volume levels are implemented by authorised personnel only. Once removed two front panel pre-sets are exposed and available for adjustment by the installer. The first calibrates the protect indication to the incoming audio and dictates the point at which ’protection’ processing commences. The second sets the absolute volume level to which the sound system is allowed to perform. If the SL22 receives increased signal levels, the transparent ’protection’ circuitry is activated which maintains the specified system volume level without degradation in sound quality. With the security plate replaced a security label can be placed across (supplied) to provide further security and show evidence of tampering with the settings. In addition, on the right side of the panel three LED indicators complement the simple setup with simple and ‘at a glance’ monitoring. To the rear the difference between the SL22 and the SP2120 is just as apparent. In its development we liaised with and were approached by local authority commissioners, installation specialists and venue owners who all advised and recommended attributes to suit their own specific requirements, the result being the addition many more versatile features that so many other sound level limiters lack. 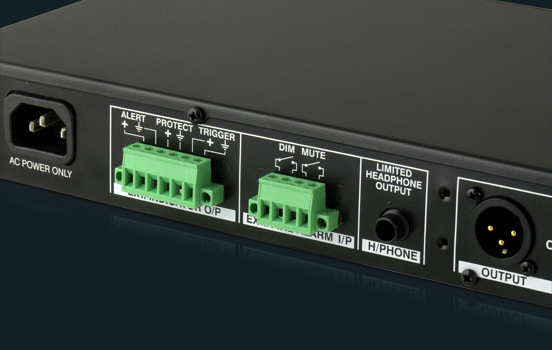 As well as the standard input and output XLRs (that can be securely locked using the optional tamperproof bracket) the SL22 also features a limited headphone output, that works in the same manner as the XLR’s, plus the ability to be controlled externally via a fire alarm or operator, and also connections to allow data logging of the SL22’s operation, or external visual indication via a light on a wall, for example.